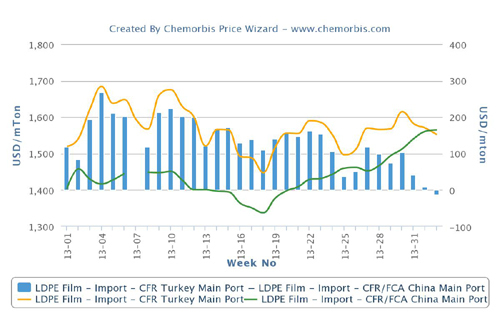 According to ChemOrbis, players in Russia are reporting limited availability for LDPE in the first week of April, similar to the case across other PE markets in Europe. Supply constraints are seen lending support to firmer PE prices in the domestic market. A Russian producer issued hikes of RUB4000/ton ($65/ton) on their LDPE 158 and 108 prices for early April. However, players said that the producer’s early April offers are not valid anymore and they are expected to announce their new prices in a week. Towards the end of last week, Russian traders reported that LDPE 158 was offered at levels as high as RUB90000/ton ($1342/ton without VAT) cash ex-works Ufa inc VAT . Two other Russian producers reportedly concluded some deals for LDPE 158 and 108 at levels almost reaching up to this threshold on local terms last week, according to players. Talk of prices above the RUB90000/ton threshold started to be voiced this week as per ChemOrbis. Planned maintenance shutdowns in the country are expected to tighten supply levels further in the April-May period. Belarus’ Polymir is not producing LDPE 108 and 102 at the present after shutting one of their LDPE lines for a planned turnaround on March 28. The shutdown was scheduled to last for three weeks. Polymir’s LDPE plant has a capacity of 150,000 tons/year. According to preliminary reports, Kazanorgsintez was planning to shut their LDPE 158 from April 15, 2015 and LDPE 108 line in May. More precise information regarding this shutdown will be available later. Ufaorgsintez is planning to shut their 100,000 tons/year LDPE plant as well as their PP plant in May for 10 days due to a planned maintenance at their pyrolysis unit.